Is it a Kissing Bug or a Leaf-footed Bug? Lately, we have received a few questions on our Facebook page asking about kissing bugs. 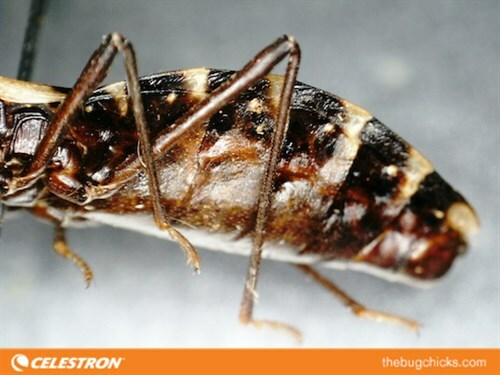 Some people have sent pictures of insects that they suspect may be the insects that transmit Chagas Disease, a parasitic infection caused by the protozoan Trypanosoma cruzi that can range from mild symptoms to congestive heart filature later in life if left untreated. There must have been some kind of news report about them, because all of a sudden, we are being contacted by people who seem concerned. 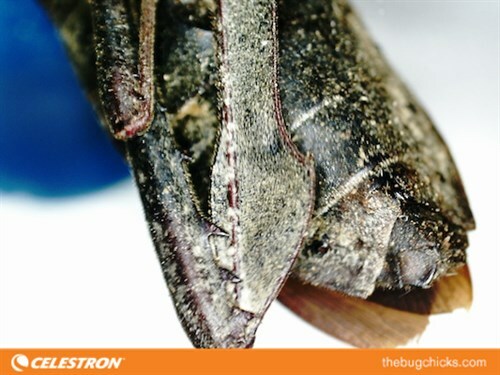 Here's a pic from a fan named Jeremy, who found this true bug in Roanoke, VA. 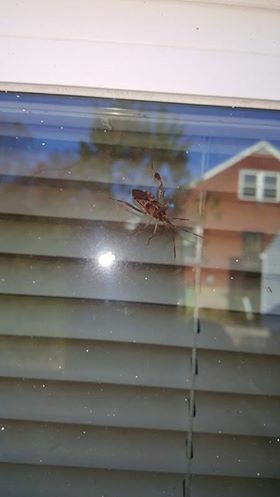 I asked if we could share this photo and walk people through how to identify if you've got a kissing bug or not. What Jeremy found is a leaf-footed bug. They DO NOT transmit Chagas disease. They eat plant juices and not animal blood. Below is a closer picture of a leaf-footed bug. 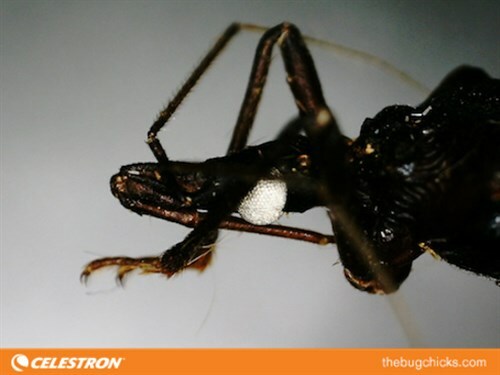 One of the clearest characteristics that you can distinguish between leaf-footed bugs (LFB) and kissing bugs is the flared, leaflike tibia on the back legs of LFB. Hence their name. 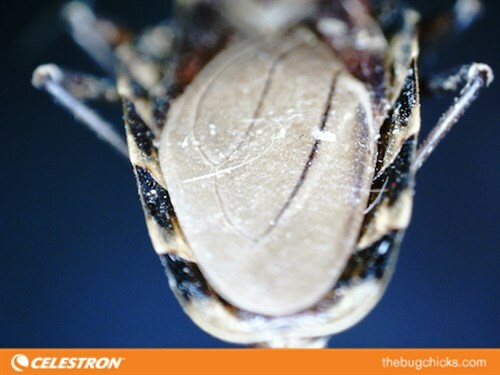 If you'd like to get a little closer, look at where the antennae arise, or are connected on the head. In LFB the antenna arise at the tip of the beak which hinges under the head. Kissing bugs are in the genus Triatoma in the Family Reduviidae. They are "true bugs" (Order Hemiptera, Suborder Heteroptera) just like LFB which means they have a hemilytra (a half hard/half membranous wing that crosses over and a piercing-sucking mouthpart called a rostrum. There are lots of species and eleven north of Mexico. The GREAT NEWS is that the species in America are NOT GREAT at transmitting Chagas. More on this later. WHERE ARE KISSING BUGS FOUND? The eleven species in the US range from California to Pennsylvania and are not found north of Nebraska. They like to live around human dwellings in wall cracks and places with slats like under porches. Blood. Mostly mammal, but some other animals too like reptiles and birds. 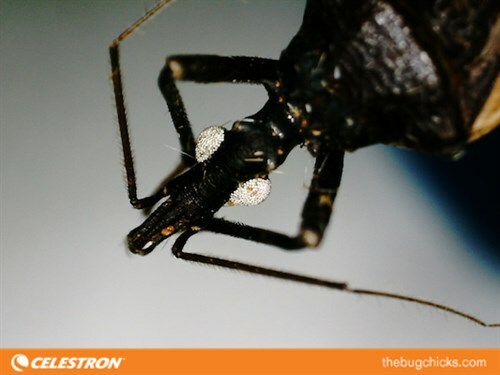 Kissing bugs have antennae that arise halfway between the eyes and the end of the snout. They are also called cone-nosed bugs because their snouts before the beak are quite long. Another prominent feature is the connexivum. This is the visible margin of the abdomen. In the Triatoma it is flared slightly upward. One last comparison between kissing bugs and LFB? The last pair of legs on kissing bugs is skinny and not flared to look like a leaf. The only reason to really think about kissing bugs (besides some uncommon allergic reactions) is that they vector a disease. 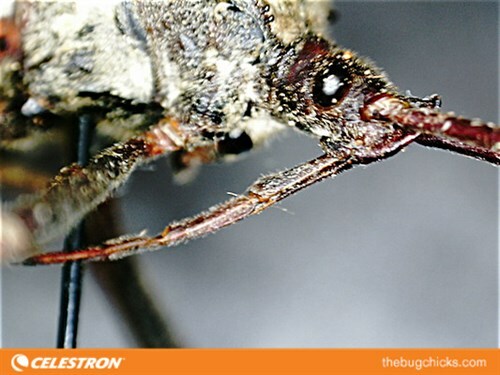 The protozoan that causes Chagas disease is transmitted after a kissing bug bites a human and then defacates into the wound. There. I said it. No easy way to do it so I just, like a bandaid, blammo! said it. Also, to add insult to injury, the bites take place around people's mouths because the bugs are attracted to the carbon dioxide of people exhaling as they sleep- hence the name "kissing bugs." So put that together and you have a bug biting you near your mouth and then pooing in the wound and you can contract a disease. Nature's weird folks. BUT! The good news is that the North American species aren't as prone to defecating where they eat so that is why, even though there are numerous Triatoma spp. 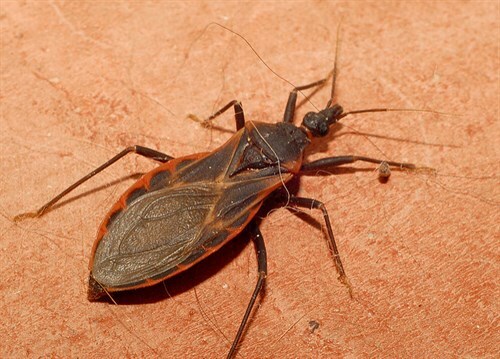 throughout the southern US, Chagas disease is not as widespread as it is in Latin America. To learn more about Chagas from experts, we suggest you go here. But no need to freak out in the States. Use insect repellant if you travel to Latin America. 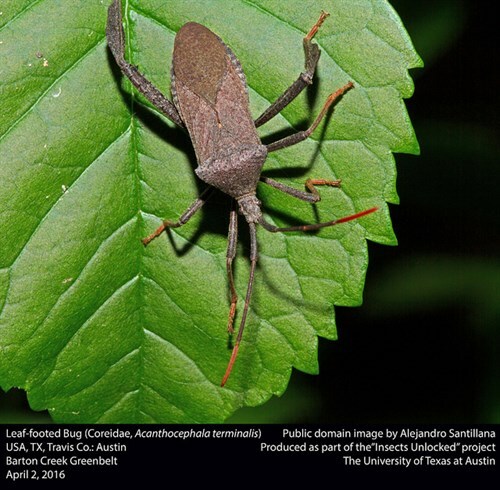 Now you can identify kissing bugs AND leaf-footed bugs! Charlie Bates Solar Astronomy Project Donates Telescope setup to Brad Zickefoose as 2016 Jon Wood award.